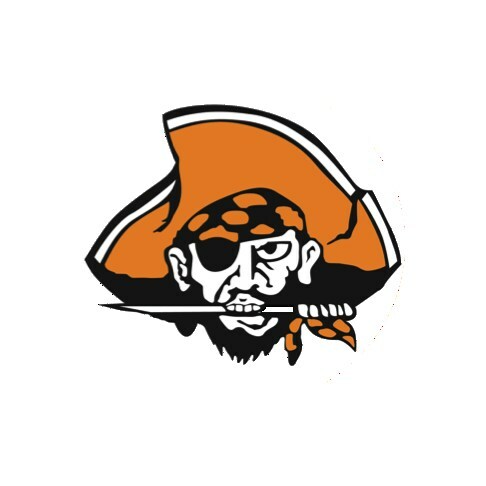 Have you ever wondered why the Santa Ynez Valley Union High School mascot is a Pirate? After all, we live in an inland valley known for it's Western traditions and Danish settlement, and our school is twenty miles from the ocean. The answer is a fascinating story. The SYHS Pirates are named after Joseph Chapman, "The Good Pirate," who was an instrumental figure in developing California's early infrastructure and first industries.The work he did designing and building a fulling mill at Mission Santa Ines after being released from imprisonment for piracy helped to fuel the Valley's fledgling economy. His story can be found on the California Missions Resource Center's website and is reprinted below. Early in the 19th century, many of the countries in the Spanish empire in the Americas began a struggle for independence. Mexico in 1810, Argentina later the same year, Paraguay in 1811. Catholic priests like Miguel Hidalgo y Castilla (known as the Padre de la Independencia) supported the movement. Hidalgo was captured in March, 1811 and shot, but the struggle continued on. It took until 1821 before Mexico, the headquarters of New Spain, won its independence. During these years of struggle, Spanish resources were diverted, and the missions in Alta California had to become more self-sufficient to survive. More ominous, there was a real threat that California would be attacked. The ports of Callao, Peru and Guayaquil, Equador were attacked in 1816. The most likely source of trouble was a privateer flying the flag of a country that was fighting Spain. Privateers were privately owned vessels armed and equipped at the owner’s expense and authorized by a belligerent party to appropriate or destroy enemy property. Just such a threat materialized along the California coast in 1818. In October of that year an American ship, the Clarion, arrived in Santa Barbara from the Sandwich Islands (Hawaii). The ship’s captain was a friend of the presidio commandant, Jose de la Guerra y Noriega. He warned Don Jose that an Argentinean backed privateer, Hipolite Bouchard, was planning an attack. The Spanish presidios, missions and pueblos were put on high alert. The Governor ordered lookouts be posted at twenty-five strategic locations along the coast. (As always the actual work fell to the Indians). Hopolite Bouchard, with two heavily armed ships and 350 men did attack in November, 1818. 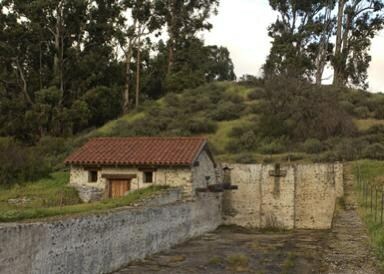 The pirates landed in Monterey and torched many of the buildings (though the Royal Presidio chapel was spared). Several of the attacking force were captured during forays in the surrounding countryside. The Spanish network along the coast mobilized for further attacks, although it wasn't clear where the pirates would strike next. Indians were recruited and trained as a militia at several missions. Coastal missions like Santa Cruz were evacuated. On December 14, Bouchard stuck again, this time at San Juan Capistrano, burning the king's storehouse, the soldiers barracks and the governor's house. This proved to be the last attack. The pirate raid was over, but its aftermath was just beginning. Several more men from the attacking force were captured or deserted in Monterey and San Juan Capistrano during the melee. One of these men would go on to make an unusual contribution to Alta California over the next thirty years. Joseph Chapman (c. 1784 -1848) was an American carpenter and blacksmith who hailed from Maine. He was pressed into service by Captain Bouchard in the Sandwich Islands. Chapman participated in the attack on California and was taken prisoner at Monterey. This 'reluctant pirate' was imprisoned for awhile and then freed to build a fulling mill (a process used to soften woolen fibre) at Mission Santa Ines, the ruins of which still stand. Chapman was a clever fellow, gifted at anything mechanical. He oversaw the building of a grist mill for Mission San Gabriel (located in San Marino), and he prepared timbers for the construction of the first church in Los Angeles. The mill he built near San Gabriel is now a museum. Chapman was baptized at San Buenaventura in 1822, and that same year married Guadalupe Ortega of Santa Barbara with whom he had five children. In 1824 Chapman bought land in Los Angeles and developed a vineyard, but still continued to do odd jobs at the missions, being a jack-of-all-trades, who apparently could make or repair anything that was needed. Joseph Chapman was a great favorite of the friars. He became a naturalized citizen and a grantee of the San Pedro Rancho. The historian Hugh Bancroft says of him "among all the earliest pioneers of California there was no more attractive character, no more popular and useful man, than Joseph Chapman the Yankee." This 'good pirate' died in 1848. Hipolite Bouchard had been dead for over a decade and his end was not as favorable. After his raid on the California coast Bouchard made his home in Peru, where he retired with the rank of captain. In reward for his services the Peruvian government gave Bouchard two ranches. On January 6, 1837 the local papers reported "Navy Captain Hipolite Bouchard, of more than 60 years of age, was suddenly killed by his own slaves two nights ago at seven, for which reason he did not express his last will nor did he receive any sacraments."